Home / Shop / Books / Social Sciences / Social and Behavioral Sciences / Preventing Underage Drinking: What Works? This book was reprinted from a public document and records from the US Government. It is a collection of hearings that took place in Washington DC by the Committee on Education and the Workforce, U.S. House of Representatives on February 11th 2004. According to Mrs. Wendy J. Hamilton, the national President of Mothers Against Drunk Driving, where she has served since 2002 (after three separate drunk driving crashes occurred within her family) – “Alcohol is the illegal drug of choice for America’s youth… [it] is a major factor in the three leading causes of death of America’s teens…. Teens have easy access to alcohol…. 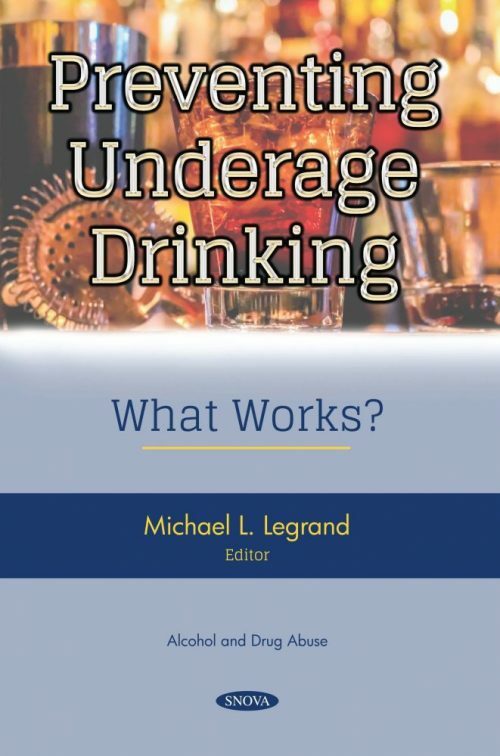 [and] the consequences are staggering.” This book provides statistics about the amount of teenagers who drink and the amount of deaths per year it contributes to. It also examines the Programs already in force for underage drinking, including Youth in Action, as well as provides recommendations on how to reduce the amount of young people who drink. It also includes education-oriented interventions that should be implemented to prevent underage drinking in the future. Molinari, Hon. Susan, Chairman, The Century Council, Washington, DC.